Sohar SWRO Company LLC is the EPC Contractor for Sohar IWP and has signed several contracts with Sulzer to supply pumps for the new 250 000 m³/day independent desalination plant in Sohar, Oman. Commercial operation is scheduled for 2018. The contracts include the manufacturing, testing, packaging, and installation supervision of the main centrifugal pumps. Seawater intake for the plant will be provided by Sulzer’s three big SJT vertical turbine pumps that will be installed at the nearby industrial port pumping station. The package also comprises axially split MSD pumps (see figure) for reverse osmosis membrane high-pressure feed service. High-suction pressure ZF pumps will boost the seawater pressurized in the energy recovery device by the reject brine. 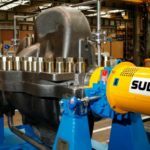 In addition, Sulzer will supply its high-efficiency Ahlstar pumps for all other low-pressure applications. In total, Sulzer will deliver 49 pumping units to the new desalination plant.